Chef Special Tandoori Kababs - Vegetarian There are 8 products to choose from. Takeaway Lanzarote - Restaurants Playa Blanca Cottage cheese marinated with herbs and yoghurt masala char grilled. Takeaway Lanzarote - Restaurants Playa Blanca Cottage cheese mashed with herbs and spices rolled on skewers char grilled. Takeaway Lanzarote - Restaurants Playa Blanca An exotic health conscious kabab, fenu greek leaves and sweet corn collided with herbs rolled on skewers char grilled. 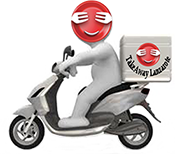 Takeaway Lanzarote - Restaurants Playa Blanca Soya chunks marinated in Tandoori Masala skewerd in Tandoor. Takeaway Lanzarote - Restaurants Playa Blanca Tender mushrooms stuffed with homemade cheese blasted with spices char grilled.